An umbilical hernia is a hernia at your umbilicus or belly button. Sometimes, it is called a para-umbilical hernia, meaning a hernia around the umbilicus. It can also be called a Ventral Hernia. The umbilicus is a point of natural weakness in the muscles of your abdominal (tummy) wall. Bowel and from inside your abdomen can protrude out and form a swelling or lump. There is no definite cause for an umbilical hernia. Increase in the pressure within your abdomen may increase the risk for formation of an umbilical hernia. Usually, no special tests are needed to diagnose an umbilical hernia. Your doctor may make the diagnosis by examination only. But sometimes, the diagnosis of a hernia may not be clear and an ultrasound scan or a CT scan may be needed. Can an umbilical hernia cause complications if it is not treated? As with any hernia, there is risk for bowel blockage and strangulation. The extent of the risk is different from person to person. For most people, it is advisable to have the umbilical hernia (also called a ventral hernia) treated in order to avoid complications later. What is the treatment for an umbilical hernia? The treatment for an umbilical hernia is an operation. Umbilical hernia surgery can be done in two ways. One way is traditional surgery through a cut directly over the hernia. This is called open umbilical hernia surgery. 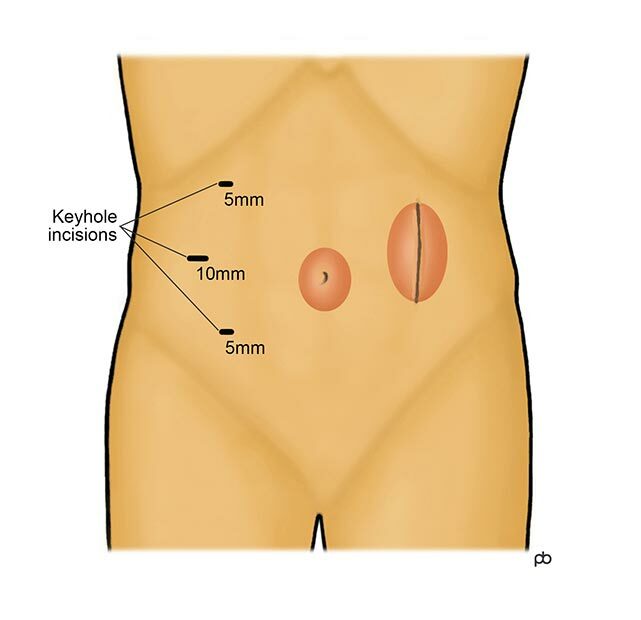 The alternative is to do the operation by keyhole surgery (laparoscopy), through small cuts that are placed away from the hernia. This is called laparoscopic umbilical hernia surgery. For small umbilical hernias, it usually is best to do an open operation. Laparoscopic surgery can be better for some larger umbilical hernias. Also, laparoscopic surgery may be better for umbilical hernias that have come back (called recurrent hernias) after previous open surgery. Laparoscopic surgery avoids cutting through the scar tissue from the previous operation because the keyhole cuts are made away from the hernia. Ultimately, the choice between open surgery and laparoscopic surgery will depend on your individual circumstances. How is an open umbilical hernia operation done? An open umbilical hernia repair operation is done under general anaesthesia. It takes about 30-45 minutes. A cut is made directly over the hernia. Usually, the hernia contains only fat. The fat may be excised or replaced back into your abdomen. If gap in the muscles is very small, it can be fixed with stitches only. If the gap is larger, a mesh is used to reinforce the muscles. The cut in the skin is closed with dissolvable stitches. This usually is a day-case operation. Most people are well enough to go home on the day of surgery itself, a few hours after the operation. How is a laparoscopic umbilical hernia operation done? A laparoscopic umbilical hernia repair operation is done under general anaesthesia. It takes about 30-60 minutes, depending on the size of the hernia. 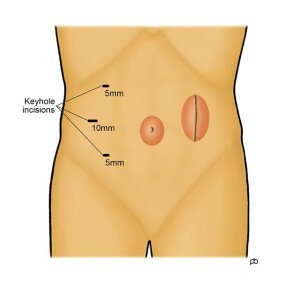 Three keyhole-sized cuts (half-an-inch or less) are made on the left or right side of the tummy, away from the hernia. Any fat or bowel in the hernia is replaced into the abdomen (tummy). A special type of mesh (called a composite mesh) is placed underneath the muscles. 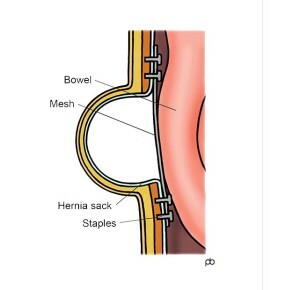 The mesh is fixed to the muscles using stitches or surgical staples. The keyhole cuts are closed with dissolvable stitches. Depending on your individual circumstances, you may be able to go home on the day of the operation itself, or you may have to stay overnight in hospital. What are the risks of umbilical hernia surgery? Like any operation on the abdomen, there is some risk of bleeding, injury to bowel and infection. Serious complications are rare . There is some risk that the hernia can come back (called recurrence of the hernia) after an operation. Broadly, the risk of recurrence is about 5%, and it will depend on your individual circumstances. Also, there is some risk of chronic pain at the site of hernia repair operation. What is the recovery from the operation? Most people are able to resume their day-to-day activities within few days after surgery. Some people will recover quicker, and others may take longer. It is best to avoid strenuous physical activity for several weeks after the operation. There is no hard and fast restriction on physical activity. It is mainly common sense. Do only what you feel you are able to do, and avoid activities that cause discomfort or a feeling of strain in the area of the operation. What is a recurrent umbilical hernia? A recurrent umbilical hernia is a hernia that has come back (recurred) after one or more operations to fix the hernia. Every hernia repair operation carries some risk for recurrence. The risk of recurrence with every operation is greater than the risk for the previous operation. An epigastric hernia is a swelling in the middle of your abdomen (tummy), in between your breastbone and your belly button. The middle of abdominal wall has two strap-like muscles (called rectus abominus) that go from the breastbone to the pelvis. These muscles have tough, fibrous coverings called fascia. An epigastric hernia develops because of a gap or defect in the fascia. Fat from within the tummy protrudes out through this gap and forms a swelling. In this way, epigastric hernias are similar to umbilical hernias. But, epigastric hernias usually are smaller than umbilical hernias and do not contain bowel. The fat that is protruding out in an epigastric hernias often is ‘pinched’ by the edges of the small gap in the fascia. As a result, epigastric hernias may be painful and cannot easily be pushed back into the tummy. The operation for an epigastric hernia is the same as that for an umbilical hernia. A Spigelian hernia is a swelling on the right or left side of the tummy wall, in the area below the bellybutton. There is a special arrangement of the muscles and their coverings in this area. This predisposes to the formation of a gap or defect in the muscles. Fat and bowel from within the tummy can protrude out to form a hernia. A hernia in this location is called a Spigelian hernia. Because Spigelian hernias are rare, a scan is done usually to confirm the diagnosis. The operation for a Spigelian hernia is similar to that for an umbilical hernia. The middle of your abdominal wall has two strap-like muscles, called the rectus abdominus. These muscles run from your breastbone to your pelvis, one on each side of your bellybutton. These muscles have tough, fibrous coverings called the rectus sheath. Each rectus muscle has a separate sheath. The two sheaths meet in the midline of the tummy wall. The junction of the two sheaths is called the linea alba. The linea alba holds the muscles together when they contract. If the linea alba becomes weak, then the muscles tend to bow outwards during contraction. This becomes especially noticeable when sitting up from a lying-down position. When the muscles bow outward, fat and bowel from within the tummy will protrude outwards and form a sausage-shaped swelling in the middle of the tummy. The condition of divarication in different from a hernia. In a hernia, there is a well-defined gap or defect in the muscles or fascia. With divarication, there no such defect. Instead, there is a generalized separation of the muscles. Divarication is very unlikely to cause problems like bowel blockage or strangulation that can happen with a hernia. Surgery is not advisable for most people with divarication because there is very high risk of re-separation of the muscles after an operation.